You know how Mondays can be. I had a hard time leaving the weekend for another five-day work week. It was a weekend filled with satisfying housekeeping, festive party-going, and relaxing leisure. How can one be expected to return to the dull beige of government employment after the color and festivity of a Mardi Gras/birthday party? The day was cold and damp, the streets and sidewalks were covered with slush and ice. A coworker spent a lot of time venting to me about the stupidity of a new program we’re using, instead of telling someone who could do something about it. Not only that, after the day job I spent an hour in a cold car dealership waiting for routine maintenance to be done on the Space Pod. All in all it was a very dreary day. 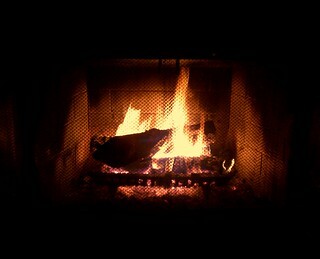 When I got home Husby had a cozy fire burning in the fireplace and supper ready for us. The crackle and glow of the fire and the delicious meal made me forget all about the discomforts of the day, and after the fire died down I went to bed early to embark on a new book. It turned out to be a pretty good Monday after all. Yeah, that Husby can read my mind sometimes. He fixed up just what I needed. Oh, what a nice way to have the day turn around! Nice husband you have there! Thanks, Cindy. I think I’ll keep him!